Robert was born at South Elmham, All Saints, Suffolk on 7 April 1805. He moved to Yarmouth in 1815 and worked as a coal heaver, unloading coal from ships in the docks. Robert is described by Ritson as a wild rough coal heaver, so rough that his presence at services for the first time occasioned some trepidation among the worshippers. He was converted between 1823 and 1825 in Yarmouth under the preaching of John Brame. (Accounts vary on the date.) By 1827 he had become a local preacher. He received his call to the ministry in 1828 initially as a hired local preacher in the Fakenham Circuit. Its inhabitants were in a very low state of mental ignorance – shrouded in darkness and steeped in sin. There was not at the time, as far as I could learn or hear of afterwards, one Christian man or woman in this parish. I entered this place in 1831, and found its inhabitants in the deepest, grossest ignorance. I could not find one God-fearing man or woman in the place. It might have ended with his death; but suddenly some of the ringleaders, despite being drunk, “were seized with compunction and changed sides”. They surrounded him, acted as a body-guard and enabled his escape, crying: “You are right and we are wrong. No man shall hurt you.” Reports indicate he was eventually taken to the George Hotel opposite in a semi-conscious state, where he was treated for his injuries and shock. In 1832, Mattishall became Robert’s base. Mattishall had become a circuit in March 1832. He hired a small cottage and lived frugally. Robert Key found a derelict Chapel in Garvestone Road, which had once been a Congregational Chapel. It was restored and he hired it for a time. It was used until 1852 when it was put up for sale and the Vicar of All Saints bought it from under Robert’s feet to the amusement of the Church of England Congregation! So instead a small school- room just 50 yards from All Saints was purchased and replaced in 1856 by a larger Chapel with 90 seats. The vicar can’t have been too pleased! In the 1830’s there was much dissent in rural communities with ‘rick-burners’ prepared to burn down farm buildings and destroy machinery. The preaching of the Primitives, Robert Key, in particular, is credited for doing as much, if not more, to stabilise the political situation than the approach of the authorities, through the way peoples live and attitudes were changed as they found faith. Wherever he was stationed, Robert Key made a difference, bringing many hundreds into the PM fold. His zeal for missionary work stayed with him throughout his life. He wrote to Conference in the Jubilee Year of 1860, concerned about the proposed use of the Jubilee fund to educate the children of ministers. He did not think that would be well received across the connexion and pleaded that the money should be used to promote overseas missions. 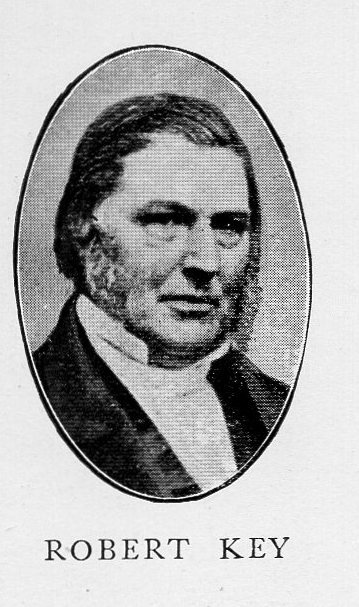 Robert retired due to ill health in 1864. He died on 2 September 1876 in Norwich. He authored ‘The Gospel among the Masses’, published in 1876. Robert married Elizabeth Maddeys (1803-1878) at Gorleston on 19 September 1824. The 1871 census shows a grandson Robert Key Turner, aged 4,residing with Robert and Elizabeth. He was the son of William Watling Turner and Mary Ann Martha Cullam Crisp. It is likely that Mary was an ‘adopted’ daughter. The probate records identify William Turner as the executor of Robert’s estate. This page was modified on 23 December 2015 to add an article from the Christian Messenger 1915.